Left to right: Detail from Jean Bourdichon’s Louis XII of France Kneeling in Prayer, Accompanied by Saints Michael, Charlemagne, Louis, and Denis (leaf from the Hours of Louis XII, 1498–99, JPGM Ms. 79a [2004.1]) and X-ray fluorescence maps showing the distribution of gold, silver, and bismuth. The presence of bismuth was discovered using spot analysis, but through imaging the full extent of its use was revealed. Photo: J. Paul Getty Museum. Images: GCI. At the Getty Conservation Institute (GCI), the incorporation of recent imaging advances into our work has allowed us to explore new avenues of research, develop holistic conservation strategies, and more effectively communicate what we do. Imaging has expanded far beyond its traditional role as a means of documentation. Newly developed imaging methods provide a wide range of information critical to the understanding and conservation of cultural heritage—from surface properties such as color and texture, to the location and shapes of underlying features, to the chemical composition or physical properties of individual components. Imaging not only helps distinguish original from restoration materials; it can also document their precise location across an object. It aids in the visualization of relationships and correlations among different components of an object, revealing, for example, where a pigment might be aging differently in different binding media. Thus, imaging allows us to better understand how objects were made and how they may have changed (or be changing) over time—essential information for conservation planning and for improving conservation interventions. Additionally, because images are a universal language, imaging helps convey complex information to a wide audience, enabling interdisciplinary work and effective communication with a broad range of stakeholders, including scientists, conservators, site managers, architects, engineers, art historians and scholars, and the general public. The scale of GCI projects can vary from an entire archaeological site or building, to a collection of objects or an individual work of art, to a minute sample removed for in-depth study. The aims of these projects are equally wide-ranging—from developing a conservation and management plan for an archaeological site, to understanding how artistic practice was organized within a workshop, to identifying individual paint layers in a cross section. As such, our imaging needs are diverse, broad ranging, and multiscale. To meet these needs we have acquired specialized equipment, enhanced our in-house expertise, and collaborated with outside partners to explore emerging technologies, all to augment our work to improve conservation practice. Imaging has long been an integral part of the GCI’s workflow, and an example of advances in imaging technology over the years increasing our ability to address research questions is found in the GCI–Getty Museum collaborative study of An Old Man in Military Costume by Rembrandt. The existence of a hidden underlying painting—an image of a man—was first discovered in 1968 through X-radiographic imaging. Conservators and curators were eager to “see” this hidden painting, as it could shed light on the artist’s working process. In the early 1990s, the painting was studied with neutron activation autoradiography. This imaging technique more clearly revealed certain components of the hidden figure, such as the robe he was wearing, and significantly, it also provided information about the distribution of chemical elements in both the underlying and the surface painting, allowing some of the pigments to be inferred. Still, questions remained. Nearly twenty years later, a preproduction model of the Bruker M6 macro-X-ray fluorescence (XRF) scanner was brought to the Getty. The painting was scanned in collaboration with Joris Dik of the University of Technology, Delft, and Koen Janssens and Geert van der Snickt of the University of Antwerp. The resulting maps provided the clearest information yet about the distribution of chemical elements across the two paintings. These element maps enabled the creation of a digital color reconstruction of the underlying figure and are now helping conservators and scholars understand how the pigments in the surface painting may have changed over time. However, there are areas of the underlying painting that remain a mystery. Notably, current imaging technologies cannot tell us what, if anything, the underlying figure is wearing on his head. Although we cannot resolve this question today, the advancement of imaging technologies will undoubtedly enable us one day to answer this and other questions. Hyperspectral imaging of Édouard Manet’s Jeanne (Spring) (oil on canvas, France, 1881, JPGM 2014.62). 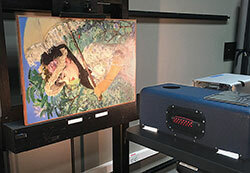 The imaging will provide information about the materials and methods used to create the painting. Imaging conducted by John Delaney of the National Gallery of Art. Photo: Douglas MacLennan, GCI. Until recently, most scientific imaging equipment could not effectively or safely be transported to more challenging environments, such as remote archaeological sites. Today, however, many imaging technologies once available only in a museum laboratory have been adapted with increasing portability for use in the field. A system that fits comfortably into a backpack, utilizing relatively simple and affordable camera equipment and filters, and enabling imaging across the visible, infrared, and ultraviolet regions of the electromagnetic spectrum, has become a regular part of the investigation phase of our projects in remote areas of Egypt, China, and Italy. Such portability proved especially valuable in work in the Tomb of Tutankhamen, in the Valley of the Kings at Luxor. Policy-based restrictions on sampling necessitated greater emphasis by the GCI–Ministry of Antiquities project team on noninvasive examination methods; imaging therefore played a significant role in the investigation of the tomb. Technical imaging of the burial chamber wall paintings provided key information for understanding Egyptian wall painting technique, current condition, and ancient and contemporary interventions undertaken in the tomb. False-color imaging—combining visible- and infrared-reflected images—clearly visualized and mapped areas of modern repainting. These areas had not been recorded previously, and the findings regarding the full extent (i.e., distribution) of this intervention would have been impossible to obtain with point analyses. Experiences like these demonstrate the power of imaging technologies, especially when combined with other forms of invasive and noninvasive investigations, to reduce the number of samples required and, when sampling is necessary, to better target areas that provide the desired information. In multi- and hyperspectral imaging, the capability of the portable imaging system is extended by increasing the number of bands across the electromagnetic spectrum over which images are collected. Besides providing images, these powerful systems allow the extraction of reflectance spectra at individual points (or selected areas) across the image, facilitating the characterization or identification of pigments and dyes. Combined with large-scale XRF mapping, which offers complementary information in the form of elemental analysis, these imaging techniques have revolutionized the examination of painted surfaces, providing unprecedented insight into the original construction and subsequent deterioration of works of art. An early example of the combined use of these two imaging technologies at the Getty was the study of Jackson Pollock’s Mural. Imaging helped answer questions about how this large and complex painting was created. With the collaboration of John Delaney of the National Gallery of Art, select areas of the eight-by-twenty-foot painting were imaged using a scanning hyperspectral camera, originally designed for terrestrial remote sensing but modified for examining works of art. Macro-XRF maps of the same areas were collected, which, together with the hyperspectral images, allowed the research team to virtually “unpack” the paint layers, determining the order in which Pollock laid down the numerous overlapping colors and shapes. Without the use of both modes of imaging, this information would have been possible only through the removal of samples for cross-sectional analysis. The inclusion of the hyperspectral images and XRF element maps in the subsequent GCI–Getty Museum exhibition proved to be an extremely engaging means of communicating the results to the public. Many visitors viewed the painting, moved on to study the imaging results displayed in an adjacent gallery, and then returned to view the painting again with the new insight provided by the imaging results. Imaging is more than static pictures capturing a specific moment in time. Video and time-lapse photography can help us understand dynamic processes such as deterioration, and they can also powerfully communicate complex information. In Dunhuang, China, flaking paint is a recurring problem at the cave temples of the Mogao Grottoes. To test a hypothesis that a previous treatment material, polyvinyl acetate (PVAc), in combination with soluble salts present in the wall paintings might be a factor in the continuing deterioration of the paintings when subjected to uncontrolled environmental conditions, the GCI–Dunhuang Academy project team used time-lapse photography to monitor tiny paint samples subjected to changing humidity levels in an environmental chamber. The resulting video clearly showed the contraction and expansion of the paint samples under fluctuating humidity. Though it is often difficult to translate what happens on test samples at the microscale to full-scale paintings, this video was a persuasive tool in communicating the potential impact of unstable environmental conditions to a range of stakeholders and highlighted the importance of preventive measures to inhibit further loss. Two-dimensional condition maps of the interior decorative surfaces at Kasbah Taourirt, Ouarzazate, Morocco (left) converted into three-dimensional models to correlate interior conditions with structural problems (right). Images: Lori Wong and Samuel Whittaker, GCI. At Kasbah Taourirt in Ouarzazate, Morocco, site of a GCI Earthen Architecture Initiative project undertaken in collaboration with the Centre de Conservation et de Réhabilitation du Patrimoine Architectural des Zones Atlasiques et Subatlasiques, the interior painted decoration was at risk of loss because of the poor condition of the earthen structure. Imaging methods were critical to the development and implementation of integrated solutions that both stabilized the architecture and preserved the interior painting. In conjunction with Carleton Immersive Media Studio, orthographic photo-elevations of the painted surfaces were generated from a photogrammetric model using MeshLab, an open source software, and were used as base images for condition mapping. Tying these two-dimensional condition maps to the overall coordinate system of the surveyed site enabled the creation of a three-dimensional model in which structural conditions, such as cracks and other architectural features, could be correlated directly with the painted decoration. These models were an important tool in the assessment, treatment development, and planning phases of the project, and they helped communicate to the structural team how to design and implement stabilization measures that avoided fragile areas of painting. These advances in three-dimensional imaging and computational modeling, utilizing photogrammetry—and, increasingly, laser scanning—allow for better correlation of conditions between the interior and exterior, improve conservation treatment design and implementation, and enhance our ability to monitor change, such as the widening of a crack or the increase of delamination of an area of painted plaster. As these select examples demonstrate, imaging technologies have proven a great asset in the GCI’s work as we document, study, investigate, plan, treat, and monitor our artistic legacy. Our current suite of imaging technologies has helped us carry out our work more efficiently, with increased specificity and accuracy—and, crucially, less invasively. It is the nature of technology to advance, with each successive development adding new capabilities and functions. Significantly, for the imaging of cultural heritage this progress means that we can look forward to increasingly portable and versatile technologies. It will be exciting to see those developments that lie ahead and the new tools they will provide as the GCI continues to develop a range of resources for conservators, conservation scientists, and other heritage professionals. Karen Trentelman is a GCI senior scientist. Lori Wong is a GCI project specialist. Imaging technologies have the power to provide detailed information across large areas and at multiple scales, but they also generate very large data sets that must be stored, organized, and managed. Importantly, they must also be integrated with other data (including text and non-image-based measurements) to inform conservation treatment and historic, artistic, technological, and cultural interpretations. To address the challenge of integrating the many different types of data relating to cultural heritage research, the Getty Conservation Institute in 2013 launched the DISCO project (Data Integration for Conservation Science). DISCO is developing management tools for scientific data—which increasingly is generated by imaging technologies—to enable it to be more easily searched, compared, integrated, and eventually, shared. Using the GCI’s Arches system as a data-management platform, DISCO will enable researchers to manage scientific data organized according to uniform standards. Making multiple different data types compatible will facilitate interrogation, visualization, and data interpretation, helping researchers, for example, draw comparisons and correlations among different works of art, different studies, and different points in an object’s history. A picture is worth a thousand words, but digital and scientific images may consist of a million or more data points. As we adopt new technologies, DISCO and Arches are creating new means of managing data to enhance the ways scientific and technical information contribute to the conservation and understanding of works of art.